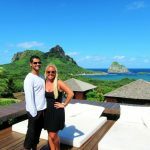 My husband and I had big, big plans for Fernando de Noronha — dare I say grandiose — since it was after all our ultimate dream destination. However, before you get too excited about seeing pictures of us from different spots on the archipelago or about reading insider suggestions on things to do and see, let me confess: we did nothing on our agenda. Not.one.thing. 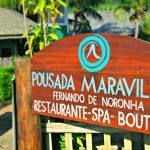 We found it almost impossible to leave our sanctuary Pousada Maravilha. What we did enjoy thoroughly though was the hotel’s infinity pool and quite possibly too many caipirinhas. Would you have been able to leave these breathtaking surroundings? 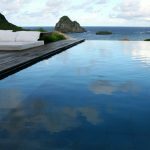 I have no doubt that the rest of Fernando de Noronha would have dazzled us, maybe even changed our lives, but we were cast under our hotel’s magical spell. My conclusion: sometimes you want to expand your horizons, while other times the most beautiful adventures are best experienced right where you are. Oh, and here is a secret that I discovered, if you do not do everything you had set out to do in the first place, well, then you have a great reason to return. To see the accompanying posts click here and here. Sometimes the best thing to do is NOTHING but enjoy each other. It sounds like bliss. The photos are gorgeous – you’re so beautiful without makeup! Looks like such an amazing trip – there’s no need to do anything ‘extra’ on a honeymoon anyways! Also – The last picture of you is STUNNING! Yes!! Return And take me with u! I will, te prometo amigaaaaaaa! i love your photos!!! maybe my hubby and i will plan our 10th wedding anniversary here (sans kids)! That’s in 2014!! Wahoooooo that would be an AMAZING place for a 10 year anniversary!!!!! Umm, I can totally see why! How beautiful!! I had this happen before when I went to Zanzibar. We had big plans to spend a few days on Zanzibar and then a few days hiking near Mt. Kilimanjaro. We got to Zanzibar and never left 🙂 We did manage to spend 1 day off the beach, on a spice tour but that was only so could tell people we did something besides lounging in paradise and snorkeling 🙂 Sometimes that’s just the best way to vacation! I’m so glad that I have people agreeing with me! Zanzibar is another ultimate dream destination for me!!! I will make sure that when I eventually visit that I leave lots of time for doing nothing! I would have done exactly the same!!!!! LOVE THIS POST:) So dreamy and colourful…I now follow you on twitter & FB. I wish you a awsome weekend. Wow these are wonderful pics! thanks for these inspirational pics! Wow…gorgeous!!! And the scenery is also lovely 🙂 Seriously, though, with a hotel that beautiful, I wouldn’t have left the grounds either! And one can never have too many caipirinhas. You are stunningly beautiful Andi! Wow thank you so much!!!! I’m blushing! Oh Andi these pics are gorgeous! Can I say that I’m enving you so much! On your honeymoon you’ve been to several wonderful places! It looks like you’re having a great time! Thank you so much for your kind words, our honeymoon was beyond perfect! Thank you for sharing this wonderful place! I may not be able to travel the world like you do, but your photos always make me feel like I’ve traveled. If you don’t mind me asking the photos really look good even underwater, what camera are you using? Keep on making us happy! You and your husband really look good together! Thank you for such a gorgeous comment! It really made my day!!! When I can’t travel I live vicariously through others, so I’m glad that you can do that through me. I have an underwater housing case for my p&s Canon S95. Love it! I promise there will be lots of more happy posts in the future. Andi your hubby is so hot! That’s exactly what we would have done. We are the worst when it comes to hanging out at the hotel when its luxurious. Love the shot where Lucas is spitting out the water – how did you capture those perfect round orbs of water?? It was a lucky shot! Only had to take 1 haha. I’m sooo happy that you and John would have done the same. Takes the guilt away! perhaps this is one of the most interesting blogs that i have ever seen!!! Wow what an awesome compliment thank you! That looks absolutely STUNNING! I would have done nothing either, just sit in the sun and stare at that beautiful ocean! Yay!!! I love that I’m getting so much support from everyone! PM truly is stunning. Couldn’t agree more my wise beautiful friend! PS We totally need to do a photo shoot there. Could you be any more beautiful? You are WAY too sweet!!! LOVE the photo of him spitting out water, awesome. The picture of Lucas spitting is amazing! I can’t fault you for not ever leaving that hotel – I think I would have found it difficult to tear myself away too. I love that shot too! Totally unplanned!!! Would love to return to PM with you and R.
You 2 are such a gorgeous couple! this was a very interesting post thanks for writing it! one word AMAZING!!! totally understand that you stayed in the hotel! I wouldnt have done any other thing! the pics looks awesome and I love the underwater pics of you! The country will always be there. Great company and the ability to kick back and relax, not always as easy as people think. 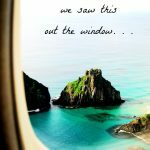 Great photos look like you had an amazing honeymoon! Wow- what a fabulous resort!! A chef I used to work with was from Brasil and always talked about it and those famous “caipirinhas”! Is there such a thing as too many? 🙂 I’m pretty sure honeymoons are for laying around and loving each other all day… check off the agenda to-do list another time! P.S. This photography is so lovely, and you look fresh faced and beautiful! Wow what an AWESOME comment, thank you sincerely! I agree, there probably isn’t a thing as too many caipirinhas, especially since we didn’t leave the resort haha. You’re such an angel for your sweet compliments!!! I had to laugh at your confession. 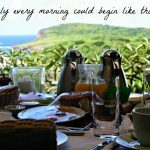 You had every excuse to do absolutely nothing on your honeymoon! You will have plenty of travels together in the future. 🙂 Hope you’re enjoying married life. You are so beautiful Andi!!! I’m totally humbled by your comment, thank you! Haha but you can!!! Why not? Instead of spending money on flowers or the wedding dress, invest it in the honeymoon??? I’m so touched by your kind words re: my pics! That picture of your husband squirting out the pool water is so cool. You guys make a gorgeous couple!! Congrats. What beautiful pictures. You are a stunner. Have a wonderful life together, record all the ‘moments’ they are your treasures. Thank you so much Sue for the reminder! All the time go after your heart…that’s my philosophy. Thanks for the visit, so nice meeting you. Happy Earth Day to you as well! Thank you sooo much for your gorgeous comment, it really touched me!!! Te mando un beso! I love those last words! Some of my favourite days while travelling have been when I didn’t do a damn thing. Oh wow that’s looks amazing!! Hi Andi, I thank you for visiting my blog and leaving a sweet comment. I am glad to get the chance to visit My Beautiful Adventures, where I am exploring and finding that you do indeed live a very adventurous life! I am impressed by your ability to explore to this extent – how blessed you are! Travel is wonderful. Love this destination, Andi! The pics are still very pretty! It really hit me on this trip that I never ever take true vacations where I return feeling more relaxed. I made a vow on our honeymoon that every year we would take at least one true vacay. Thanks for your sweet words re: my pics. Haha you’re right one can never have too many! Greetings from Kuala Lumpur, Malaysia. I’ve been following your blog for sometime. I must congratulate you on the beautiful photographs!!! And your prose is good too. Gypsy or not, you appear to have been born to pen your stories & share to the world.